Special order items large enough to accommodate your equipment. NEMA3R rated, white powder-coated aluminum enclosures feature hinged, key lockable doors with dust covers on locks and gasketed door. Passive cooling ventilation. Two rear ½” electrical knockouts. 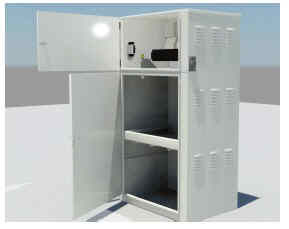 The SunWize Power UPS Cabinets are NEMA3R rated, white powder-coated aluminum enclosures featuring hinged, key lockable doors with dust covers on locks and gasketed doors. The UPS Cabinet has two separate enclosures; one for a system's batteries and one for the electronics. It can hold upto twelve L16, eight 4D, or six 8D batteries.